MSE Creative Consulting Blog: Will Weather Science Now Get the Credit it Deserves? 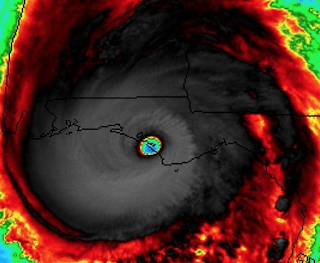 Will Weather Science Now Get the Credit it Deserves? to the science of meteorology this morning. There is a very good case to be made that more than 3,000 would have been killed by Hurricane Michael absent weather science. 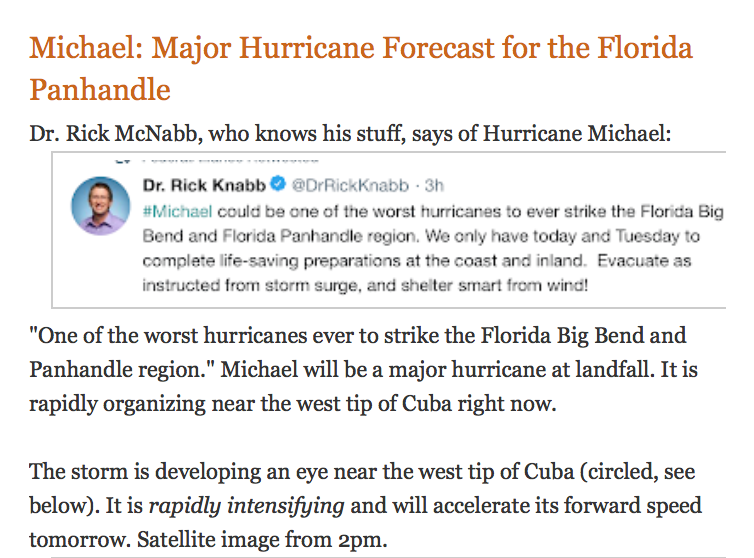 Since Hurricane Katrina, when former New Orleans mayor (now inmate) Ray Nagin blamed meteorologists for the huge death toll in Katrina --when weather science actually did superb job -- I have taken up the mantle of obtaining for meteorology the the respect it deserves. We are, by far, the most successful of the predictive sciences and thousands of lives are saved each year by our work. In spite of that, meteorology is often the "Rodney Dangerfield of Sciences" -- we get no respect. Consider the list below of the most intense hurricanes to strike the United States and the number of fatalities they produced. *Updated as of 8am Friday. See a correlation between warning quality and deaths? Of course. Below (courtesy CBS47) is a photo taken this morning of the utter devastation. Had Hurricane Michael struck without warning, the death toll would have been in the thousands given the population of the area affected. Consider this: The population of Galveston, Texas, in 1900 was about 42,000. Eight thousand were killed in the hurricane two months after the census was taken. That is 19% of the population. The Great Hurricane of 1900 was a strong Category 4. 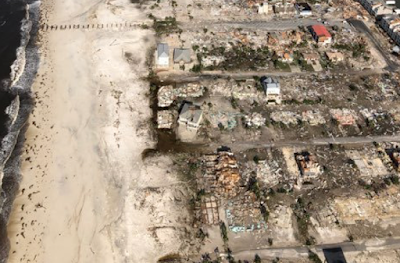 In 2018, the population of the City of Panama Beach, plus the people living on down the beaches to Mexico Beach, is about 18,000. Multiply that by 19% = 3,400 deaths from Hurricane Michael. Michael was a strong Category 4. The forecasts of Michael's future location, like with Florence's, were incredibly good. Incredible. The forecast below was from noon Sunday. Note the H = hurricane off the coast of the Florida Panhandle. Please note: nearly 24 hours before landfall, the forecast said the 120 mph wind speed forecast should be raised. 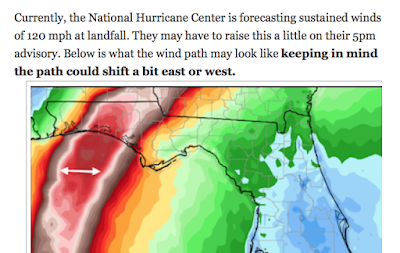 The wind swath forecast was very, very close to the actual path of the highest winds. Monday, 11:30pm. 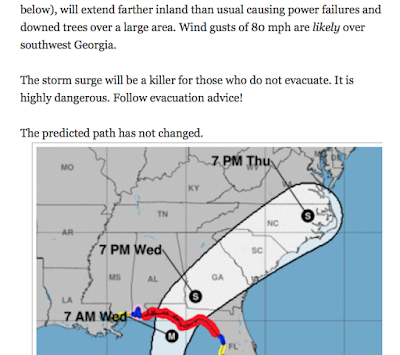 "The storm surge will be a killer for those who do not evacuate. It is highly dangerous." Based on the damage photos (above) that was a prophetic statement. Here are some preliminary measured wind gusts. 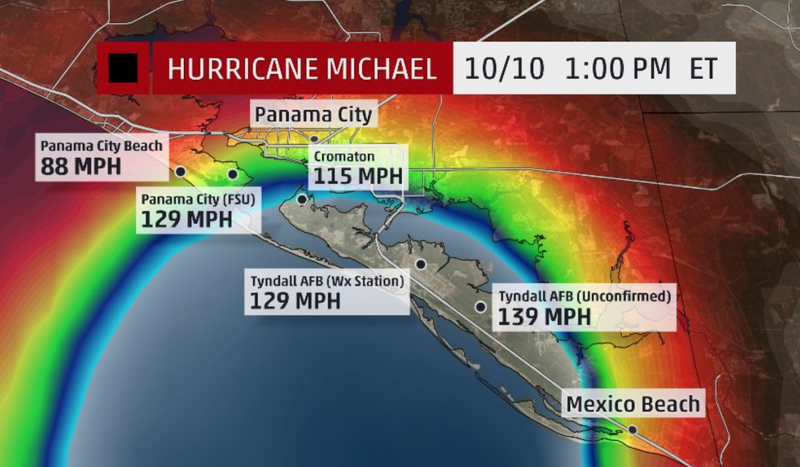 Mexico Beach likely received even higher winds. There is no Nobel or other major prize for meteorology. There is no televised Oscars or other ceremony. Congress is still playing games with the nomination of Barry Myers to head NOAA. His leadership is needed if we are to continue to improve the quality of storm warnings and their effectiveness. If you are interested in this subject, I immodestly recommend my book . 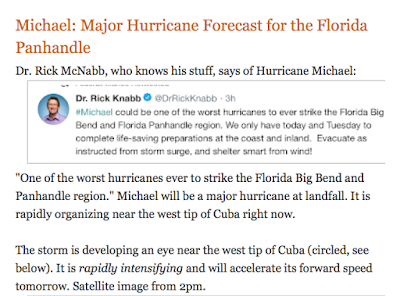 Regardless, it is time to view the science of meteorology in a different light; perhaps the level of esteem should be at least as high as that for economists (I'll put our forecasts against their's anytime, yet they get a Nobel Prize). We save lives routinely; they infrequently do. 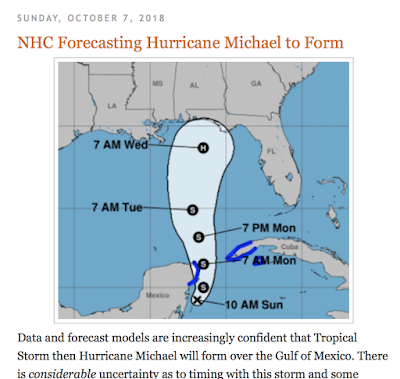 The scientists at the National Hurricane Center, the National Weather Service as a whole, and the entire meteorological enterprise (companies like AccuWeather, television meteorologists, etc.) deserve tremendous praise. 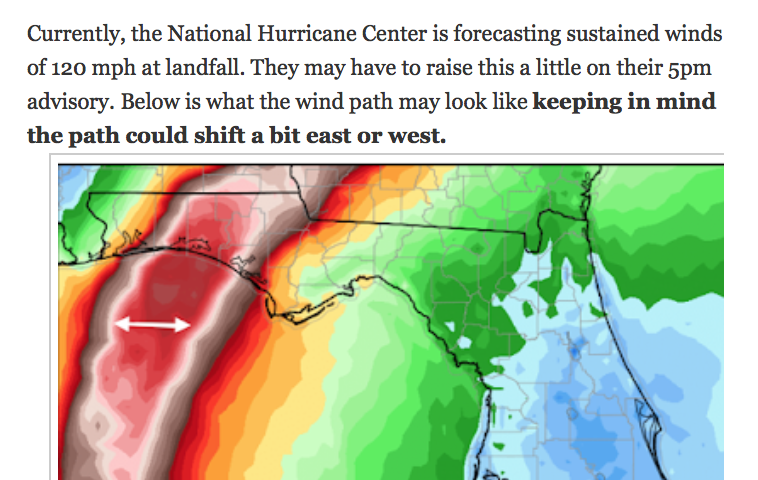 In addition, the meteorologists at the NWS at Tallahassee and people like Ginger Zee who responsibly covered the storm (from inside a concrete building not outside like fools) deserve additional praise for their courage. So, I hope you will view weather science in a different light going forward. Thank you.